Melissa Ongais was born with the side of her face pushed back. Muenke syndrome, a condition related to craniosynotosis, a premature closure of the skull. Melissa underwent her first surgery at 3 1/2 months mold to correct her physical appearance. A second corrective surgery when Melissa was 5 closed the soft spot in her skull, and a third surgery a few years later fixed the remaining bony defects on her forehead and head. When she was old enough to understand her condition, she felt lots of emotions. Non of those worries existed when she was in the presence of the medical staff of Kapiolani Medical Center for Women & Children. 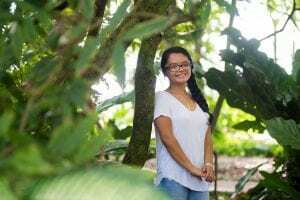 Today, Melissa is a 16-year-old student at Aiea High School. She no longer wonders why this condition happened to her, because she believes that everything happens for a reason. Next post: Miss Hawaii’s Novemeber 2018 Recap!